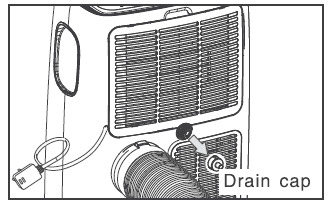 When storing the air conditioner for an extended period of time or to clear the P1 message the air conditioner needs to be drained. 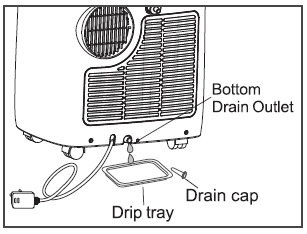 Put a drip tray, not supplied, under the continuous drain outlet located on the back of AC, then unscrew the drain cap to allow the water to flow into the drip tray. Replace the drain cap to the continuous drain outlet when no more water flows out. Put the drip tray under the bottom drain outlet, then remove the rubber stopper from the drain outlet to allow the water to flow into the drip tray. To ensure all water has been removed tilt the unit slightly towards the rear. Replace the drain cap to the bottom drain outlet when no more water flows out.